Rainwater collection systems gather the water that would normally run off after a rain into a rainwater catchment or rainwater cistern, and saves it for later use. Typically this will be for maintaining lawns, gardens and landscaping but it can even be used for human consumption if properly treated. When Mark Leder and Rosemarie Rossetti designed their home they not only wanted to create a home that was handicap accessible, but one that was earth-friendly. Their home, which doubles as the Universal Design Living Laboratory, is also a showcase of green technologies. One of those technologies is a system for harvesting rainwater. All the water that strikes their roof, and much of it that strikes their patio, is collected in channels that drains to an underground rainwater cistern (also known as a rainwater catchment). Not only is their system green, it is also low maintenance. Mark designed the system to be gutterless. Without gutters you avoid the issue of removing debris from the gutters. You avoid the problem of ice dams forming around the gutters. You also improve the looks of the house. It improves the looks of the house because gutters impose big, wide unnatural lines on a house. The gutters have to have a small slope, so they are never quite even with the edge of the house. Downspouts interrupt the shape of the house at the corners. While we have become almost blind to the problems they cause, when we see a house without gutters it looks sharper, and more clearly defined. To see how a gutterless system works lets follow the rain that lands on Mark’s house. Rain that strikes the upper roof will drop off the edge of the upper roof and onto the lower roof, but all that rain striking in one place would tend to discolor the paint on his metal roof. To overcome this first issue Mark installed the rain handler system that is patented by the folks at rainhandler.com. 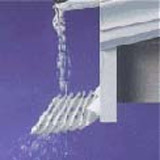 A rain handler is not a gutter, rather it is a rain dispersal system. Rain falls off the edge of the roof, but strikes the rain handler, which has a series of angled louvers that cause the water to break into droplets. The louvers are each angled a little differently so the rain is dispersed over a three-foot wide area instead of in a narrow line. Going from the upper roof to the lower roof this only serves protect the roof, but the same system on a lower roof would spread the rainfall out so that it could be absorbed by the grass or bushes, without eroding the soil. You would still need to drain that water away from the house, but you wouldn’t have to worry about the rain destroying your grass and kicking mud up onto your siding. In Mark’s case he wanted to collect the water into a rainwater collection system, so he did not use the rain handler system on his lower eaves. Instead he lets the water flow off in sheets, but immediately below each eave is an open, grated drain pipe, and on either side of that is his patio. Mark’s eaves extend out six feet from the house. A patio surround his house up to and just beyond this drain. Since he has concrete or tile on either side of the drain there is no debris being kicked up by water coming off the roof. The drains surround the house but slope down to the back of his house. Immediately behind the open patio that extends out from the living room the drains disappear below ground. There they drain into an underground tank that serves as the rainwater cistern. I have a rainwater cistern next to my house, and it operates on a similar principle except that my house uses gutters. My house was built in 1906 and the rainwater cistern was the backup to the pump. If the summer was dry and the well failed the cistern could supply the house for several weeks. It turns out that the well is reliable and the rainwater cistern was never used, although it was always full and ready. Harvesting rainwater was pretty common, back in the day. A community a few miles away was not so lucky with the groundwater and people there almost solely relied on rainwater cisterns. Unfortunately cisterns can become contaminated and health departments began to discourage their use. In some cases laws even prohibited their use, so they became increasingly less popular throughout the twentieth century. Now, in places where water is scarce, they are again being recognized as an appropriate means for supplying household water. In some countries where natural sources of water is scarce, or unreliable, rainwater catchments or rainwater tanks are required for all new construction. In California, where water permits are required for wells or taking water from streams, no permit is required if you are using water from a rainwater collection system. These governments are recognizing that harvesting rainwater is a component of their public water supply strategy. In Mark’s case his rainwater collection system feeds into a tank that is only going to be used for horticultural purposes. Usually such systems are called rainwater catchments. A rainwater catchment does not have to rely on roof runoff. They can collect water from the natural drainage of the land. For the suburbanite like Mark the main benefit is maintaining the ability to keep his plants alive when a drought comes around, like it did last summer. 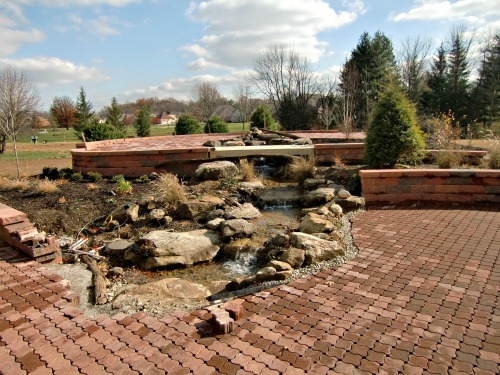 It also provides a opportunity for Mark to have a nice waterfall and water garden right next to his beautiful patio. But, while the benefit to Mark is mainly aesthetic, it provides a benefit to the surrounding region whenever it rains. Normally the rain that hits Mark’s roof would hit the yard and drain away to local streams and rivers. When a big rain comes that runoff adds to the flooding. With a rainwater collection system that storm load is reduced. Now Mark isn’t going to single-handedly save the folks downstream, but thousands of homeowners harvesting rainwater could have an impact. If you don’t think that this important consider this. Most modern commercial construction will require some kind of stormwater containment for this very reason. Water hitting the parking lots was making it to the stream too fast causing local flooding where they had not experienced this before. Under current practices new parking lots require some kind of storm water retention system to prevent this type of surge. A residential catchment serves the same function while also helping the homeowner keep his grass green. Such a system doesn’t have to be fancy. My nephew in Georgia got tired of seeing his plants die. Now he uses rain barrels to catch his run off. These are simply barrels at the bottom of his downspouts. Such a simple form of rainwater harvesting may not keep his yard green but it will allow him to save the bushes and plants that he most values. The benefit of a rain barrel is that it is easy to install. Mark’s water is stored in buried tanks. My old rainwater cistern was concrete, with an above ground cap that was a bit of an eyesore. 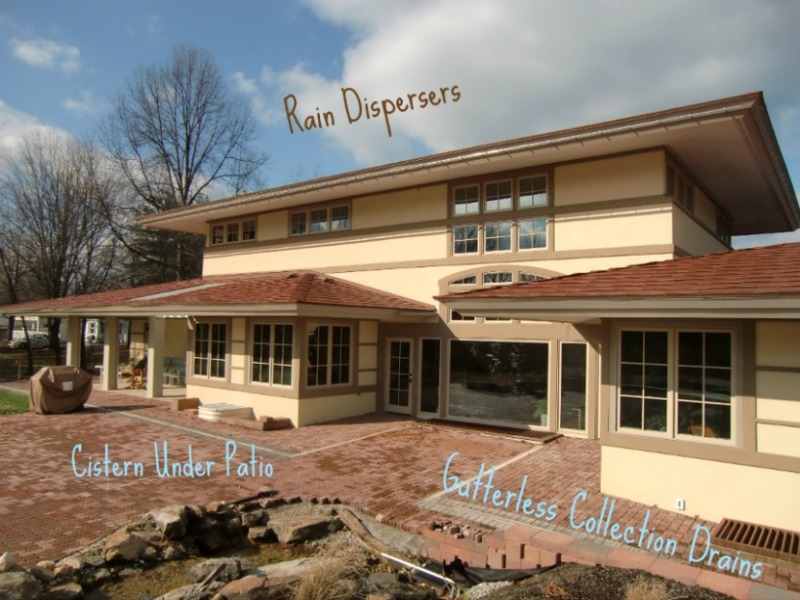 What your rainwater collection system will look like is up to you but here are some ideas. Tie your collection system into a water garden like Mark has done. Better yet, make it into a reflecting pool. The ripples will give a shimmer to the light and some of that calm serenity of the pool will make its way into your home. You can even place the pools right below the eaves, then supply them from above with a rain handler system. The dispersed droplets coming off the rain handler in a heavy rain will put on an impressive show for those inside. A rainwater collection system can be beautiful and useful. If you have an existing set of French drains around your house, place your rainwater catchment so that the French drains supply the water. Use a pond for your rainwater collection system. It will lose water to evaporation, but you might get to swim of fish in it. If you want to be really green, but are hesitant to use your water for drinking, install a gray water system. Gray water is essentially used household water that is used for non-potable applications, like flushing toilets. You can do something similar with your rainwater collection system. The toilets and sinks and bathtubs can get their water from the rainwater cistern, while you use city water or well water for drinking. If you are installing a rainwater catchment of some kind, or have already done so, let me know. Share you story. I’d love to hear from you. Have you got a story about an earth-friendly home?